Lock in a great price for Magnus Hotel – rated 8.3 by recent guests! Place of the hotel. It's near bus and train stations. The center avenue also near, as well as shopping center Akropolis. You can walk to those places on foot. Very nice location for transit travellers or short stay. Close to the railway station and just by the main bus station. City center is not far - about 10 min walk. Hotel room was good, just feel a bit old. Nice location, good parking conditions. Breakfast was nice. Well located in front of the bus station and 3 minutes walking from the train station. Spacious and clean rooms. Good breakfast. Good hotel,nice and clean,good location,good breakfast. Everything was great! The staff, room, bed, tidiness. Plus you can expand checking out time if 12 is to early, it was super helpful since my flight was only at 8. Location of this hotel is great, in case you are interesting to stay during your transit through the Kaunas. Hotel is near bus (1 min.) and train (5 min.) stations and close to Kaunas center. Reception is working 24h, accordingly the would be no any issue with late check-in and early check-out. You can find super market inside bus station and food marked near train station. The hotel room was clean and comfortable. WiFi was also quite good. Magnus Hotel This rating is a reflection of how the property compares to the industry standard when it comes to price, facilities and services available. It's based on a self-evaluation by the property. Use this rating to help choose your stay! 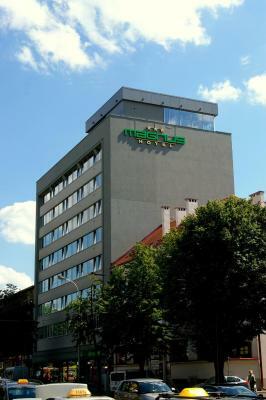 Located directly by Kaunas’s main bus station, Magnus Hotel offers rooms with a flat-screen cable TV. Free Wi-Fi is available in public areas. The hotel provides free private car parking. The rooms of the Magnus feature a classic and elegant interior design. Each has a work desk and a private bathroom with a hairdryer. Kaunas’s main railway station is 1,500 feet from the Magnus. Akropolis shopping center is within 1,950 feet and Laisvės alėja is 2,800 feet away. The Old Town is 1.7 mi away, and is easily accessible with public transportation. The restaurant serves Lithuanian and international cuisine. The breakfast buffet is available in the mornings. The terrace on the ninth floor has a bar and offers panoramic views of Kaunas. The hotel’s staff is available 24 hours a day. 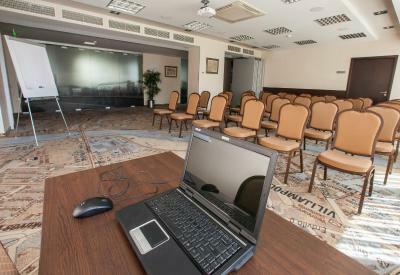 There are computers for guests’ use in the business center. When would you like to stay at Magnus Hotel? Room decorated in modern style with carpeted floors. Spacious, air-conditioned room with a mini-bar. House Rules Magnus Hotel takes special requests – add in the next step! Magnus Hotel accepts these cards and reserves the right to temporarily hold an amount prior to arrival. Please note that busses are charged extra for parking. One of the most picturesque neighborhoods in Kaunas! Staff, they don’t talk even if u say hello there is no answer or bye have a nice day, there is no answer, very cold. Quite place and at same time near to center, also nice supermarket in 1 min, near to the riverside, was clean n hot. Good location if you need to go to the airport early in the morning. Akropolis with many shops and restarants is just in 5-10 minutes walk. The hotel is quite basic but enough for a short stay. Not much to say, it was Excellent. great location, room was big, clean , comfy bed, big balcony. Very good location. Cousy place to stay. I was given a room on 6th floor but on the main street side and you can hear noise of vehicles until 3 o'clock in the morning. And top that the room next to my was noisy too. This is my last stay in Magnus hotel. 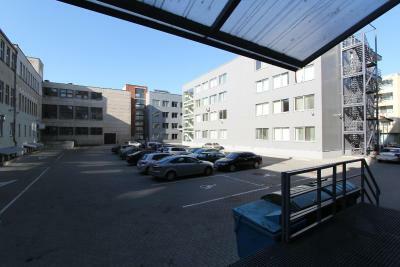 Nice location, free parking, near to bus and railway stations. Good breakfast! Room was a bit small. Near to Zalgiris arena, which was the main criteria. A bit far from Old town (3km). Neighbourhood a bit old, didn't look so nice. 2 person room was a bit small, we relocated the furniture, to have more space. Breakfast ok, could be better, more variety [no bacon :)].